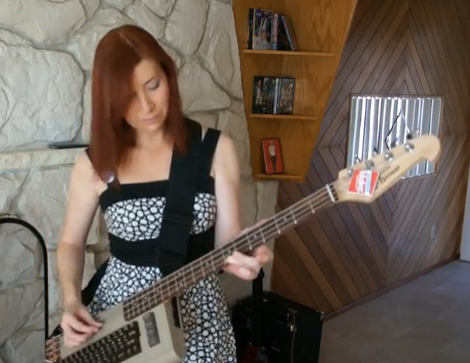 [Jeri Ellsworth] finally set aside some time to talk about the build process for her Commodore 64 bass keytar. We think what started by taking a band saw to the guitar body ended up as a fantastic new instrument. When she was showing off the project at Maker Faire we really only got a cursory look at what it could do. Her most recent video covers all that went into pulling off the project. Once the bulk of the guitar body was gone she tore the guts out of a dead c64 in order to mate the case with the guitar neck. Always the craftsman, she altered the computer’s badge to preserve the iconic look, then went to work adding pickups to each string using piezo sensors. This was done with Maker Faire in mind because magnetic pickups would have been unreliable around all of the tesla coils one might find at the event. These were amplified and filtered before being processed via an FPGA which connects to the original c64 SID 6581 chip. Very nice. I was considering a similar polyphonic build using the GinSing synthesizer shield and Arduino, so I found your use of piezo pickups a nice idea for note detection. Thanks for your insight and ingenuity! When I first saw pictures of this from Maker Faire, I assumed it was just a fairly quick mod of a Commodore 64 case to use as the body of a bass. I’m rather impressed to see not only that there’s lots more going on electronics wise, but that the keyboard has actually been used as part of the functionality instead of just adding extra switches. Rather good hack if I’m honest. So can you describe the frequency counter section for the mixed waveforms? Are you using FFT? Is it truly ployphonic? but Jerri’s keytar has many wave-shapes available! that makes it multi-genere capable, something new. personally i’d like to hear two or three of em playing at same time, in different waveshapes! Perhaps you should check out the work of Jan Hammer. He had the unique ability to actually make the resonance sound like overdrive. He also did a lot of slow stuff too, but his “guitar solos” are quite extraordinary. Beyond that, you are correct. I always enjoyed how bored Nick Rhodes looked, cig in one hand and one finger playing arpeggios with the other lol. A Commodore 64 on roller skates! Also that is awesome. I am continually amazed by the quality of Jeri’s projects. Brillient! I’m so glad it doesn’t use an arduino! This is truely a righteous hack. anyone here remember an issue of ‘Softalk’ magazine back in the eighties – perhaps about 1982 – which featured Dave(?) someone playing an instrument made from a guitar neck on an Apple ][? I think it was played at one of Woz’s massive ‘US Festival’ concerts. I do not remember that but would be willing to guess it was Dave Smith, if it was any dave. It would also fit with MIDI release timeframe to the public. Ugh I am so glad it wasn’t Ray Kurzweil, the Thomas Edison/Steve Jobs of the synth industry. Money grubbing hack that he is. I saw you at MF! This stuff is way over my head, but I think it’s awesome. Brilliant. Nice to see the better half doing some really cool stuff. You go girl. I accidentally fell in love. Sssttttttooooooopp killing c64’s for modding.. gi kill some zx spectrums or ataris instead.. or macs.. even pcs.. but stay away from working commodore stuff…. please. Jeri can destroy as many C64s as she sees fit… If we ever run low, she can just make more. It occurs to me that what her project lacks is… Macros. FYI, I wouldn’t do a C64, but she has some impressive baggage along those lines, so kudos for keeping the theme strong. And… Sunshine of my Love – so many happy times playing that song while cruising in the time machine. All excellent harbingers of fortune! But you’re missing macros. POWERFUL macros. Do it. And for good lord, if you can read between the lines, do it with an eye to revenue. The problem: Wayne’s World guitar shop scene. The solution: JE’s macros. It’s a much bigger audience than C64 anything. Think autotune. A generation of (talentless) would-be adolescent rock gods (some of them in their 40s) await your ability to transform them into passable players. I have additional clues if needed, but you there’s a market for it. Or you could just go back to working on flux capacitors. The ability to arpreggiate and correct for key modes should be simple. Let’s look at musical styles – what level of bass-playing proficiency is required to play like Flea, or Les Claypool, or any of a dozen gifted bassists, from jaco to paco? The truth is that many geeks and would-be musicians have terrible timing and pitch; They may be able to think in 6/8 (or worse, 8/6) but can seldom turn that inner music into outer music. Maybe they have timing, maybe they have pitch – but the interface to motor control skills often lags their ambition. Some musicians and purists have an issue with the idea of enhanced music, but to me it’s like automatic transmission, anti-lock brakes, spell checkers in browsers or fuel/air profiles in a car- sometimes a little invisible assistance has a big benefit. One that people will pay for. She even thought of the tesla coils and battery duration for the maker faire. I think I would marry this woman any given day. Wow! I think what started by taking a band saw to the guitar body ended up as a fantastic new instrument.